Spring is one of the best times for lawn seeding, with weather and precipitation ideal for establishing new turfgrass. Seeding is a highly effective way to repair damaged lawns-even lawns with severe grub, heat or drought damage. It’s also a great way to add thickness and newer insect and drought resistant varieties to lawns that are already in good shape. Regardless of your lawn’s current condition, seeding can serve to greatly improve the appearance and health of the grass. An excellent choice to repair heat- and drought- damaged lawns. Our specialized machine cuts through dead turf and applies new seed directly into the soil, bringing the lawn back to life. This process thickens existing turf and introduces new varieties of grass. Core aeration is performed, and then the lawn is seeded with a broadcast spreader. 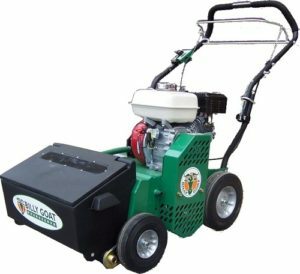 This program is best for lawns without large bare patches. Topdressing is a sand or prepared soil mix applied to the surface of the lawn. The term topdressing also is used for the process of applying the material. Topdressing materials are evenly applied in a thin layer, typically ¼ inch (6.35 mm) or less, for a variety of purposes.